Aarav's journey to hearing......: Tuesday !! - 30 Weeks!! As of 25 December 2012, Aarav's hearing age is 30 weeks!!!! 1 - DON'T remove my ears please!! We celebrated Christmas yesterday for the first time, complete with the tree and jingle bells and sweets and Santa!! Aarav dressed up as Santa and rode on his horse-powered-Bike and shared his candies with his farm animals!! All in all a lot of fun!! By the time it was evening, Aarav was pretty tired. 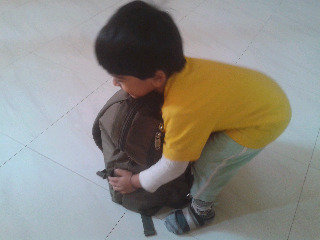 But as Kaustubh did not have a holiday yesterday, Aarav wanted to spend time with him. So he stayed awake later than usual. Usually by 10:30 - 11:00 pm his CI batteries get depleted and the Neptune starts its orange-beeping. As it is already sleeping time, I usually do not change the batteries and let them get depleted completely. Aarav too does not mind that peace and quiet before sleeping time. If I am not near him, I let the batteries beep and die, but if I am, I switch the Neptune off. The beeping drives me crazy. Yesterday around 10:45 Pm the batteries got depleted and started beeping. I pulled the Neptune out from the pouch in the lanyard and switched it off. IMMEDIATELY, Aarav got annoyed and pointed at the Neptune, and told me .."HAVA!!! DE"
He still wanted to hear and was not ready for the silence yet!! 1 - On Boys and shopping.. I have been missing his therapies for a few times now. Hate it. I have been too busy at work and at home and the rest of the times, I have been unwell. The last time we went, our therapist told me to now introduce two items at a time to Aarav and make him remember the list of items. Both of them. For eg. "Aarav get me a Cow and an Elephant"
What we expect is that Aarav should pick one in each hand and get them both. What happens is, either he gets only the elephant or only the cow, or totally gets bored by the concept of overloading his memory and getting anything at all. How does the boy remember what we had done with-the-correct-sequence a few weeks/months back but cannot get two items on a list properly? Being lazy or just being a Boy? Boys and shopping never works out. They just bring the entire shop home. Anyway. More practice for now. Kaustubh picks Aarav up from his daycare and then he takes him for a long ride on his bike. After the first long ride, when Kaustubh comes back in the building car park to park his bike and come up home, Aarav asks for one more ride..
A few times, Kaustubh made him say it. "Baba Aarav la bhooor gheun ja"
Aarav repeated, "Baba Aavava Bhooo"
And then he got the second bike ride. Now, whenever he wants to go for a ride, he makes a sweet face, and repeats "Baba Aavava Bhooo"
Randomly as well. He remembers what to say when he wants to go out!!! He is using his words now properly. Happy. Happy. Even More Happy. To encourage what he does or to show preference of one object over another, We use the words 'Chaan Chaan'. Which means that 'this is nicer than that object', or 'you look nice now'..
Basically it is to appreciate and enforce good behavior.. Since a few days, Aarav is now using the very same words to tell us that he thinks something is nice. If he gets a choice between salads and sweet corn , he points to the corn and says 'Aa aa' .. Yes, yes.... His 'aa' sounds like every other aa aa word that Aarav says till now, but the gesture is included. And now that we have been hearing his babbles for so long, we can make out his babbled words even without gesture. They sound like the actual word. If a lip reader would see him speak, his facial expressions and lip movements too show most of the true word. If we put some music on TV, or the cell phone, Aarav now starts dancing. He does the Balle balle dance and tells that he heard the music as well!! 6 - Music appreciation when not wanted ??!! A few days back Aarav and I were sleeping in the main room on the couch. The HA was removed but Neptune was still kept on and working. I muted the Television and silenced my cell phone. Then told Aarav to please lie down and"Eyes Band"
Aarav closed his eyes and pretended to sleep. At the same time, some music started playing outside the house from a neighbour's tv..
Aarav opened his eyes, and looked at me, and pointed to his ears and started the balle balle dance again!!! As if to say, "Dance time with the music on!! I am not sleeping." These are the times, when I have to actually scold Aarav to stop listening!!! 7 - Word count of the day? I keep a list of Aarav's word count. All the consonants except Ba and now La are missing. However, we are still considering only the ‘speaks repeatedly’ count now! !